This surely has to be the London Marathon of cycle rides. But there is just one tandem in fancy dress, one guy with a ghetto blaster strapped to one of those bike trucks Dutch mothers use to push their children round: this is otherwise deadly serious stuff. Yet somehow the nerves start to ease waiting around for over an hour to start, taunted by the Olympic Velodrome as a reminder that to real cyclists this is nothing. I am in Wave H at the back with the tandems and beerguts – the better cyclists will be finishing as we start. One problem with the Ride 100 is that the first bit is much the best. And it might have been designed for C20 members – swooping down the closed A12 and A103 past Balfron Tower, right past Robin Hood Gardens and under Canary Wharf. I’m sorry that we won’t have such privileged road closures for PoMo on Pedals. But my eyes are also on not crashing into the bikes in front and – after all that wait – the challenge is on to beat down all the G, F, Es etc that are way ahead. The Tower of London appears suddenly and looks tiny. Then the Walkie Talkie looms, best avoided by speeding past it. Trafalgar Square is heaving, as is the rise up to New Zealand House – there is a water stop, but simpler to keep going. I didn’t realise that that would be the story of the day. The next highlight is going over the Hammersmith Flyover level with The Ark. If London is all about the luxury of swirling down the middle of major carriageways and through red lights, Surrey is all about the people. In Kingston there are crowds lining the streets and cheering us on. I should be cheering them for bothering to get out of bed. On one closed road, they’ve even got the barbie going in the street. A kid has made a sign, ‘Welcome to Molesey’; in Weybridge the band is out; in Dorking nearly everyone is out. This is where you realise what big business these rides are for the major charities. Nearly every rider bar me is riding for one of them (in their shirts), and they have cheerleaders and drink stalls lining the road for their riders. This is where I realise mistake no.1. I don’t have a water bottle, and the official drinks stops don’t do plastic cups. At Hampton Court a kind lady takes pity on me, and I also gain two fancy gels and a banana. That is the last official food available on the course; all the fast boys in front have already scoffed the rest. So, through Byfleet, Pyrford, Ripley, a long straight bit to West Horsley and Newlands Corner, and Abinger Hammer is Lutyens country – suddenly it’s not only beautiful, but I’m actually half way. I celebrate by stopping at a newsagents for an ice cream; it tastes disgusting. The fizzy pop is better. Holmbury St Mary is Oliver Hill country, but Joldwynds and Maryland are out of view. I’m reminded of when Alan Powers and I got two coaches stuck head to head down a country lane back in 1995. This time it is because so many cyclists are stuck on Leith Hill that we all have to dismount and push. The same thing happens in Dorking High Street. But Box Hill is glorious – a long but steady climb with lots of switchbacks to the stunning view at the top. And a café, rammed. This is where I realise the only way I can finish is not to stop. There is no point in stopping, indeed, and best not to think about sweet shops and loos. Cycling is just a rhythm, so don’t think about it. Leatherhead – look out for the Thorndike Theatre. Esher – I wave at the Royston Summers houses in Lakeside Drive, recently made a Conservation Area. Thames Ditton, and the Thames never looked so good: it is the first sight of home. Kingston: we pedal right through the old square this time, then double back under ABK’s Waitrose to where the cheer girls supporting Tommy’s are still waving their huge sparkly pompoms as they had four hours earlier; it’s the one spot where the course runs back to back. Then Norbiton and Wimbledon and suddenly a bend gives on to that cheeky hill up to Richard Rogers’s house; I can charge at hills, but this is one more than I needed. ‘Come on, woman in red’ somebody shouts encouragingly. Along, along Wimbledon Parkside past the Ackroydon Estate and Portsmouth Road is ours past Alton East. Then down the hill through Putney, and I think, is this as close to being an Olympic rider as I’ll ever get? Answer, yes. For this is where mistake no.2 kicks in. What else have I forgotten? Socks. Those beautiful, simple garments that must have been among mankind’s first creations, and my plimsolls are rubbing – I still haven’t advanced to cleats. But it’s over Putney Bridge, down the King’s Road and it’s all looking lovely and familiar. Down on to the Embankment and I’m counting down those last four miles. What has happened to the roof of Lot’s Road Power Station, to the chimneys of Battersea Power Station, how lovely Churchill Gardens looks, and how strange to see it and Dolphin Square from this side. The Tate looks oddly normal; Whitehall has been narrowed down and there are people gathered. And so into The Mall. People are slapping their hands on the plastic banners that cover the metal crash barriers and the sound carries like drumbeats on all sides. Do you make the most of that moment of celebration or hit the middle of the track and race for the line? Suddenly it was all over. There’s a medal, a bottle of water – but no loo. I pedal home rather gingerly. The oddest part was suddenly realising that real life had resumed and I had to stop at the traffic lights on Piccadilly. Car drivers must have hated us, but it was exhilarating – and it shows what you can do with 24,999 people around you, and support from loyal friends like you back home. Pluses: getting on London’s main roads with no other traffic – sorry car drivers; the Surrey Hills – this really is a game of two halves and the scenery is great. Minuses: there are really too many people, the stops provided are too small and promised food and water runs out. I also resented being shouted at to get to one side by the faster riders. There is exceptional pressure, as you have to do the course in 8½ hours or you’re thrown off so the professional race can come through: I didn’t realise all those crowds were waiting for Bradley Wiggins later. For the record, the time for rider no.45829 (Harwood, Elain GBR) was 6 hours, 19 minutes, far better than I dreamed was possible. 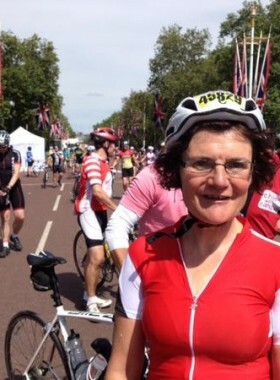 In September Elain will be tackling the Paris-Geneva cycle challenge to raise funds for C20 Society. Click to read more or sponsor her. 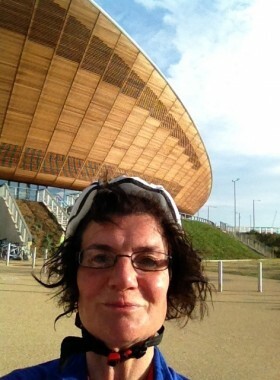 Join her and fellow cycling historian Barnabas Calder for Pomo on Pedals on 30 August.